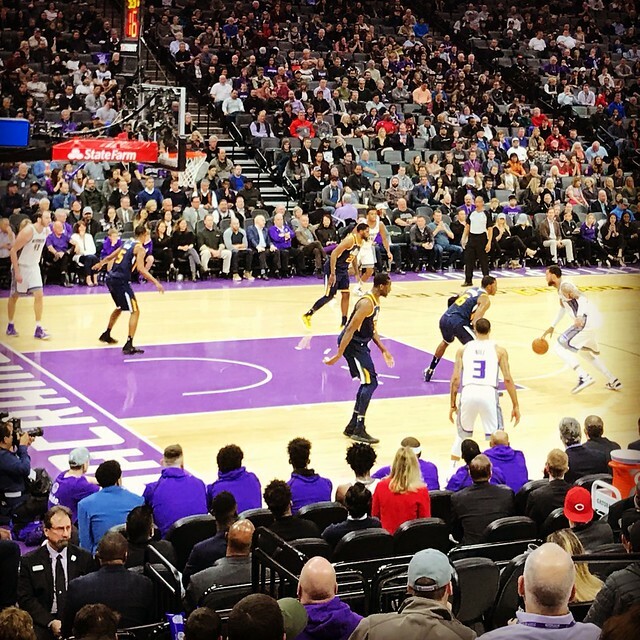 I went by myself to the Sacramento Kings versus Utah Jazz NBA basketball game at Golden One Center. I am trying to see at least one game a month this season. I bought a very nice single ticket on the aisle: Section 119, Row A, Seat 7. The game was close for most of the first half. With 1:49 left in the second quarter, the Kings trailed by 5. The Jazz went on a run and opened the lead to 10 at half time. After the first three and a half minutes of the third quarter, the Jazz had opened the lead to 20 points. Although the Kings made a couple of small runs, they never really got back in the game and lost by the score of 120 to 105. I spent most of the game focusing on De'Aaron Fox. When he was out, I switched to watching Bogdanovic. It was very fun to watch Fox because he was matched against Rickey Rubio most of the game. After scoring six points in the first quarter, Fox was scoreless for the rest of the game. He fouled out with about two minutes remaining in the game. On the other hand, Bogdan had 25 points. Playing 39 minutes, he was 9 for 11 from the field, 6 for 6 from three and 1 for 1 from the free throw line. Wille Cauley-Stein was the Kings high scorer. He had 26 points on 11 for 18 from the field, 0 for 1 from three and 4 for 6 from the free throw line. Cauley-Stein added 10 rebounds. The Jazz high scorer was rookie Donovan Mitchell. He had 35 points on 14 for 19 from the field, 1 for 4 from three and 5 for 7 from the free throw line. Mitchell had a spectacular a one-handed dunk in the third quarter. Although I didn't connect with them, the Sanborns were in their seats; Marlene and I exchanged text messages. At half-time, I met up with Snipes. He was at the game with Keith. The Kings now have 4 wins and 1 loss in games that I have see in person during the 2017-2018 season.